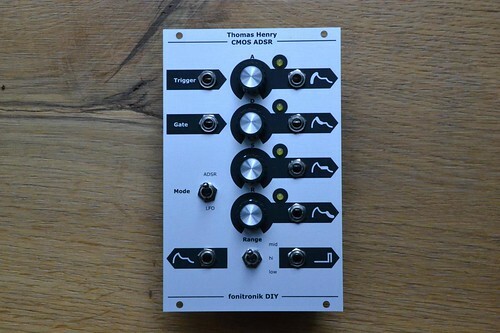 some time ago thomas henry published several new circuits in his sub-forum over at electro-music.com. i allready did PCB/panel runs for the controller lfo and the 555-VCO. with thomas' permission i am now offering PCBs and front panels for the CMOS ADSR. everything depends on the interest, so just indicate what you need/want via posting in this thread, PM, or email (be honest, please). i am taking pre-orders until 14 JUN 2013.
i thought it would be a good idea to add gate outputs for the stages, and an end trigger. the end trigger could be patched to the trigger input, making this a LFO - or simply trigger a 2nd module. anyways, i asked thomas and he was fine with adding the additional circuitry to the PCB. another change is the range switch: the original schematic uses a SPDT on-on giving you 2 ranges (two timing caps) , while my PCB will provide a footprint for a 3rd timing cap, giving you three ranges using a SPDT on-off-on switch. last but not least the eurorack front panel PCB and printed frontpanel provide a mode switch (LFO/ADSR), routing the end trigger back to the trigger input making the ADSR a LFO (attack and decay looped). nevertheless, one will still be able to build it in the original way, w/o the additional outputs,. 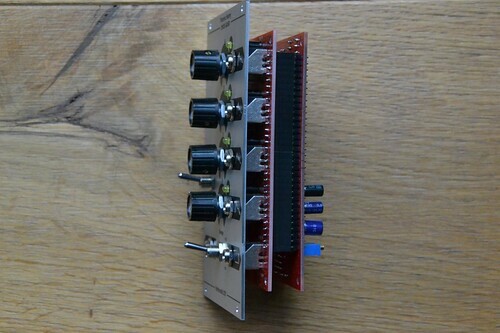 however, the eurorack components will include all additional circuitry. again, there i will offer a circuit board providing MTA-100 connectors for manual wiring, and an additional euorack front panel PCB, which would be piggyback mounted to enable an eurorack build w/o any wiring. 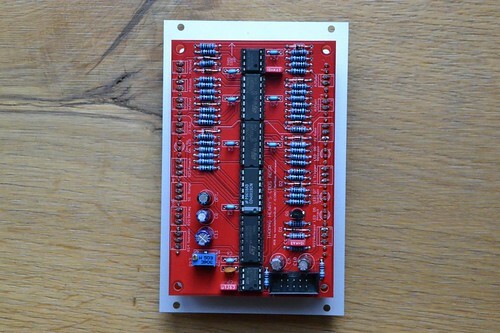 i will offer printed front panels as well (same design as the LFO and VCO), if there was enough interest. the minimum for those will be 30pcs. i fear i cannot keep the price the same as for the LFO and VCO, it actually did not cover my expenses! A valued member of this board recently detected an error on the circuit PCB. I did not notice it, since the two units i built worked flawless from the start despite the error. What is the output level of this? Can it put out 10v envelopes? Don't worry about the price rise, you've put a lot of effort into all this! It's VC ADSR or not? What's the jacks close ATT, DEC, SUS and rel??? two PCB sets (main+eurorack) and two panels if offered. count me in for 2 full sets. Though my backlog is too huge for another project. I'll take a full set of PCBs and a panel. Looks great, I would be interested in 2 full sets of pcbs and panels for sure. fonik makes the most classy looking modules around! I'm interested in 1 set of pcb's (1 circuit / 1 eurorack). Thanks! Put me down for 2 circuit only PCB's thanks matthias. Nice! Depending on the price I'll do 2 or 4 of the circuit board PCBs.